Posted on Thu, Jan 31, 2013 : 5:59 a.m. 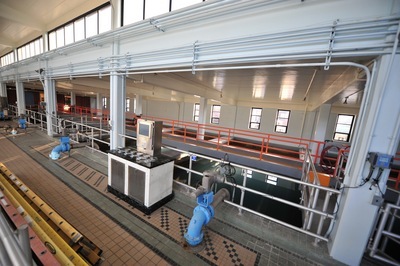 The Ann Arbor Water Treatment Plant includes two plants named Plant 1 and Plant 2. The treatment and settling basins for Plant 1, shown here, were constructed in 1938 and might need to be replaced in the next five to 10 years. Plant 1 was not treating water on this day but its basins, which are uncovered, were still filled with water being circulated to avoid freezing. Beyond a barbed-wire fence along Sunset Road stands Ann Arbor's Water Treatment Plant, a colossal facility that works 24/7 to turn Huron River water into drinkable tap water. The plant pumps on average more than 15 million gallons of water per day to some 125,000 city water customers, including some in Scio and Ann Arbor townships. City officials are beginning to seriously think about replacing portions of the plant that date back to the 1930s, and that's expected to cost tens of millions of dollars. Tom Crawford, the city's chief financial officer, called attention to that fact at a recent city budget retreat, warning City Council members it's an issue on the horizon. Molly Robinson has been the city's water treatment services manager since 2010 and before that was the city's water quality manager since 2007. 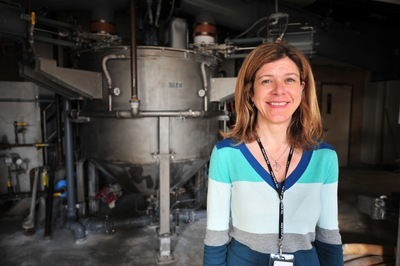 She oversees a staff of about 30 employees at the Water Treatment Plant. The city has been increasing water rates each year in the range of 3 to 4 percent, but city officials acknowledge the work needed at the plant, possibly in the next five to 10 years, is going to require more money than those programmed rate increases provide. Molly Robinson, the city's water treatment services manager, said she's hoping the city moves forward soon with a study to nail down the costs and consider various options. "There are a lot of new technologies out there that are different shapes and sizes, and it's hard to say what we'd go with, which is exactly why we need the study," she said. Until a study is completed, city officials are hesitant to estimate what the project might cost, how much the city might have to borrow, and what impact it might have on water rates. "Our goal would be to complete this study and get estimates for what it would cost to construct the new basins," Robinson said. "And then start looking at saving some money — setting some money aside so that, in five or 10 years, we would have some portion of the construction costs set aside and we wouldn't have to raise rates that much." The city-run water treatment facility at 919 Sunset Road is comprised of two lime-softening plants, an ozone generation building, chemical addition and filtration units, pumps and storage. Craig Hupy, the city's public services administrator, said the two plants are referred to as Plant 1 and Plant 2. The treatment and settling basins for Plant 1 were constructed in 1938. The basins for Plant 2 were constructed between the late 1960s and early 1970s. 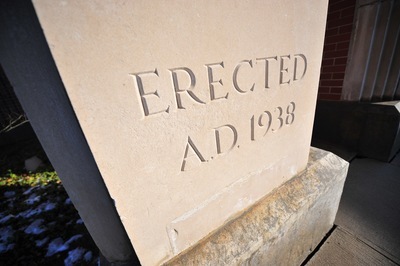 A marking near the entrance to the Ann Arbor Water Treatment Plant indicates its age. Plant 1 is becoming hard to maintain, Hupy said, and the operating technology is dated. From a space and energy standpoint, he said, there are more efficient processes today. Robinson briefed City Administrator Steve Powers on the issue in a Jan. 14 memo, noting water treatment technology and basin design have significantly improved since Plant 1's basins were constructed three-quarters of a century ago. She said the rectangular basins contain many moving parts, are inefficient in mixing and sludge removal, and are maintenance-intensive. "We'll have two or three guys spend four or five days at a time hosing out these basins in the spring and fall because of the sludge accumulation in the corners," Robinson said, overlooking Plant 1 on a recent afternoon. "Because they're not circular, the sludge tends to form in the corners and it can't get out unless we come in with fire hoses and actually push the sludge out." 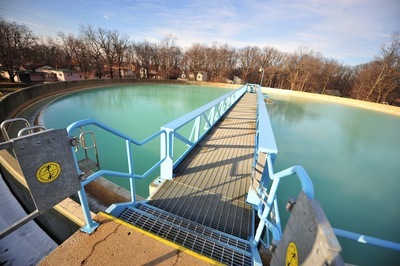 In 2006, the city completed a master plan for the Water Treatment Plant. A prioritized list of capital improvement projects was generated based on the plan's recommendations. The highest priority was replacement of the lime storage and feed systems for both plants, since they were found to be in poor condition and posed a safety hazard. Robinson said the city immediately began planning for the replacement, secured low-interest loans and other funding for the project, and in 2010 began construction. One of the systems is in service now, and construction for the second is expected to be complete in June 2013. That's costing the city about $4.4 million. Another recommended project in the master plan is replacement of Plant 1's basins. In order to complete a project of that magnitude, Robinson said, the city must begin planning years in advance of the actual construction, just as it did with the lime feed storage system replacement. The circular basins for Plant 2 were constructed between the late 1960s and early 1970s. 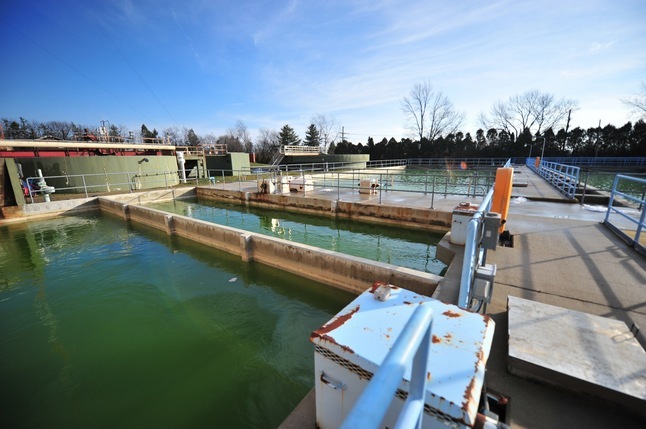 Robinson said Ann Arbor's water treatment plant is the only one in Michigan with uncovered treatment basins, leaving them exposed to the outside elements and prone to parts breaking from freezing. Significant staff time is spent repairing drives and chains, replacing boards and hosing basins, she said. "The other thing is this requires a lot of space, as you can see," she said, standing over the rectangular basins. The newer plant, which has circular basins, has a maximum output of 28 million gallons per day, while the original plant from the 1930s has a maximum output of 22 million gallons per day. "If you were to replace this with new technology, you could put all 50 million gallons in this same footprint," Robinson said, noting that could free up space on site for new treatment processes that might be required in the future because of new regulations. "It could allow us to put in a full-scale research facility, which is actually my vision of the future here in Ann Arbor," she added. 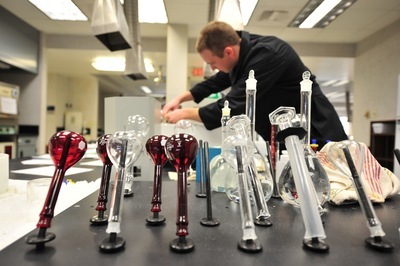 With a full-scale research facility, Robinson believes Ann Arbor could become a national leader in studying emerging contaminants and technology. "We have a unique opportunity here because we have the University of Michigan and Eastern Michigan University right in our backyard," she said. "So we have partnership opportunities we could be taking advantage of. There are constantly requests for participation in studies on emerging contaminants and things like that — new technologies." About 85 percent of the water pumped to the Water Treatment Plant comes from an intake pipe at Barton Pond, while 15 percent comes from wells located at the city's airport. "We're one of only seven inland river supplies in Michigan, and so we're unique in that way," Robinson said, adding that presents unique treatment challenges. Because the city uses surface water as a source, the water goes through a complete treatment that consists of rapid mixing for quick dispersion of chemicals being added, flocculation to give the chemical reaction time it needs, settling to allow the removal of solids by gravity, and filtration. John Danielson, an environmental lab analyst for the city of Ann Arbor, fixes a squeaky water pump that helps cool the graphite furnace on an atomic absorption spectrometer on a recent afternoon. The city softens the water using lime, removing calcium and magnesium. The city uses ozone as the primary disinfectant and a compound made up of chlorine and ammonia as a secondary disinfectant. Fluoride is added to the water for dental protection, and phosphate is added to stabilize the water. When AnnArbor.com visited the site on a recent afternoon, Plant 1 was not in service. Robinson explained that's typical. While no water was being treated by Plant 1, it was in standby mode. If something happened to Plant 2, the older plant would be ready to go. "Most of the year, we only need one of them. In the summer, we will run both plants," Robinson said. "In drinking water, we always want to have redundancy. We need to be able to take one plant out of service and then provide water to everybody without interruption." Asked whether replacement of Plant 1's basins could end up being as expensive as renovations at the city's 1930s-era Wastewater Treatment Plant, Robinson said that's unlikely. The City Council voted nearly a year ago to authorize up to $120 million in revenue bonds for that project. "It wouldn't be $100 million — it's not like the wastewater plant rebuild," Robinson said of the water plant's needs. "Because we've already replaced our lime feed system, and so we're just talking about these basins right now, but it's still significant dollars." Heavy construction equipment has been on site at the Water Treatment Plant lately as part of the West High Service Pump Station Project. The $11 million project includes replacement of aging pumping equipment that serves the west side of Ann Arbor and Scio Township, and the cost is being shared with Scio Township. That project includes construction of a three-story pump station (two floors below grade) next to the eastern side of the plant's administration building. As city officials turn their attention to Plant 1, Robinson said she feels confident the city is ahead of the curve in terms of planning for the Water Treatment Plant's future. "The whole idea of starting the study now is so that we can be quite proactive in our planning and we don't find ourselves in a situation where we feel a sense of urgency," she said. "Because the last thing you want with drinking water is to feel a sense of urgency. You always want to plan in advance." Sat, Feb 2, 2013 : 3:22 a.m.
Why do we need a study, don't we employ qualified people who should know what we need? Or do they give these jobs to unqualified individuals? Sat, Feb 2, 2013 : 3:20 a.m. I'm confused. Are we talking water treatment for consumnption or sewage treatmenmt? The article seems to combine the two. Fri, Feb 1, 2013 : 2:15 p.m. Sorry no discussion of the 1,4-dioxane Gelman/Pall groundwater contamination plume that could jeopardize our 85% source of drinking water. Maybe that's the extra treatment system space discussed, although I've not heard of a meaningful contingency plan for this. The prohibition zone for the plume was recently expanded by Honorable Judge Donald Sheldon toward Barton Pond, without additional monitoring wells contrary to recommendations of MDEQ The city of Ann Arbor has closed one of its two-groundwater wells due to contamination at great loss to the city drinking water system. Groundwater is used especially in the winter to save cost in treatment for drinking water of the much colder river water. The wells also serve as critical backup water supply if the river experiences a contamination spill from the nearby highway or railroad tracks. EPA is considering changes in exposure levels of 1,4-Dioxane due to recent changes in EPA's estimation of toxicity, some reliable sources say it could be as low as 8 to 3 ppb, or lower, for the drinking water standard. The state currently allows up to 85 ppb in private wells. Thu, Jan 31, 2013 : 8:04 p.m.
&quot;City officials are beginning to seriously think about replacing portions of the plant&quot; Really? Because later you acknowledge that &quot;In 2006, the city completed a master plan for the Water Treatment Plant. A prioritized list of capital improvement projects was generated based on the plan's recommendations.&quot; Sounds to me that they've been thinking seriously about it for over 6 years. Thu, Jan 31, 2013 : 9:54 p.m. It was identified as a need in 2006, and now the city talking about going forward with a study to look at actually doing the project, figuring out costs, possible options, etc. It seems to me it's being moved off the back burner and onto the front burner, hence the phrasing that the city is beginning to think seriously about this. Thu, Jan 31, 2013 : 6:37 p.m.
Get ready for higher and higher water rates!! Get the fluoride out of the drinking water! Many cities are eliminating this unnecessary chemical additive. Too much lime and sediment in the drinking water. Thu, Jan 31, 2013 : 6:14 p.m. Millions to update? No problem, that is what the capital funds are for. Thu, Jan 31, 2013 : 5:45 p.m. It doesn't matter what they do to the water facility, because I still won't trust it. And I don't need to trust it, because I have a counter-top water distiller that cleans out the crap that they put in. Chloride and fluoride belong in a chemistry lab, not our drinking water. But anyways, if they want to make the infrastructure more reliable so I can keep getting water for my distiller, then I'm all for it. Just don't add any new chemicals please! My distiller already smells like a chemistry lab from all the precipitate at the bottom! Thu, Jan 31, 2013 : 7:18 p.m. I agree with you, but I don't think there's a lawsuit, especially because the CDC still says that fluoride is harmless, and even helpful for teeth. They will cite numerous &quot;scientific&quot; studies to support this. So you and I know that they're prematurely killing thousands of citizens and their children, but they're only doing it out of ignorance. It's up to us as consumers to hold their feet to the fire and force them to stop poisoning us. Be it fluoride, genetically modified/processed foods or pesticides, if we keep allowing them to blindfold us then we are only killing ourselves. We need to put it to a vote, but I'm afraid even the general population is mostly ignorant on the dangers of fluoride, so even this probably won't get us anywhere. Thu, Jan 31, 2013 : 6:42 p.m. I am glad more people are learning the truth about fluoride and other toxins put in our water under the guise of helping us. Government is soooo concerned about our teeth they are mass medicating the public with fluoride. Yet, they support dangerous GMOs, mercury in vaccines, aspartame in diet drinks, corn syrup in baby formulas (up to 70% of some baby formulas consist of sugars. No wonder we have an obesity epidemic), pesticides in baby formulas, pink slime in hamberger that contain ammonia, and numerous other chemicals and toxins in our food and drinks. But, fluoride is good for our teeth. How is toxic waste good for our teeth? Actually, it is very bad for our teeth. It is so toxic, even at 1ppm, it was causing dental fluorosis in children. Consequently, the city of AA, two years ago, had to reduce the level to 0.7 ppm. Do you, city of AA, know how many children you have damaged? Not only their teeth but bones, organs and skin. I am surprised the city has not been sued yet. As people learn the truth, maybe AA will be sued. Thu, Jan 31, 2013 : 5:25 p.m. It is nice the city off AA is improving the water treatment facility. One recommendation. Please stop fluoridating the water. Anyone that spend only an hour researching fluoride will quickly realize fluoride is nothing more than toxic industrial waste. Much of it imported from China's industrial factories. Millions of people are coming to this realization and having it removed from their cities all over the US and Canada. How redicous is it for Ann Arbor city officials to pay to poison its constituants? Fluoride is detrimental to your health and it has no benefits for your teeth. That is a myth. A few months ago Harvard published a study that confirms fluoride reduces IQ levels. Before anyone criticizes me, please do your own research. By the way, the FDA lists fluoride as a very dangerous neurotoxin. So is Aspartame. Thu, Jan 31, 2013 : 6:29 p.m.
LOL Dr. Strangelove. GREAT MOVIE! That's why the Russians don't drink water, right? They only drink straight vodka to avoid the fluoride. Thu, Jan 31, 2013 : 6:02 p.m.
General Jack D. Ripper: Mandrake, do you realize that in addition to fluoridating water, why, there are studies underway to fluoridate salt, flour, fruit juices, soup, sugar, milk... ice cream. Ice cream, Mandrake, children's ice cream. Group Capt. Lionel Mandrake: [very nervous] Lord, Jack. General Jack D. Ripper: You know when fluoridation first began? Group Capt. Lionel Mandrake: I... no, no. I don't, Jack. General Jack D. Ripper: Nineteen hundred and forty-six. 1946, Mandrake. How does that coincide with your post-war Commie conspiracy, huh? It's incredibly obvious, isn't it? A foreign substance is introduced into our precious bodily fluids without the knowledge of the individual. Certainly without any choice. That's the way your hard-core Commie works. Group Capt. Lionel Mandrake: Uh, Jack, Jack, listen... tell me, tell me, Jack. When did you first... become... well, develop this theory? General Jack D. Ripper: [somewhat embarassed] Well, I, uh... I... I... first became aware of it, Mandrake, during the physical act of love. Group Capt. Lionel Mandrake: Hmm. General Jack D. Ripper: Yes, a uh, a profound sense of fatigue... a feeling of emptiness followed. Luckily I... I was able to interpret these feelings correctly. Loss of essence. Group Capt. Lionel Mandrake: Hmm. General Jack D. Ripper: I can assure you it has not recurred, Mandrake. Women uh... women sense my power and they seek the life essence. I, uh... I do not avoid women, Mandrake. Group Capt. Lionel Mandrake: No. General Jack D. Ripper: But I... I do deny them my essence. Thu, Jan 31, 2013 : 5:47 p.m.
You beat me to it! (See my post below) That's why I only drink distilled water - which I distill myself at home. Stop the chloride too! Thu, Jan 31, 2013 : 4:53 p.m.
People in Ann Arbor should feel very proud to have the Water that they do. My dad worked for that water plant for almost 20 years and it is the best water around. Improvements that need to be made to the Plant should be made and hopefully it happens. Thu, Jan 31, 2013 : 2:51 p.m.
Thu, Jan 31, 2013 : 9:50 p.m.
Thu, Jan 31, 2013 : 8:10 p.m. They use the lime to &quot;soften&quot; the water, which means to remove dissolved minerals from the water. Surface water in most of Michigan is quite &quot;hard&quot; -- it has lots of dissolved minerals in it, especially calcium. Softening at the plant removes some, but not all of it. Thu, Jan 31, 2013 : 8:01 p.m.
You've got it backwards. The lime is added to get rid of the calcium in the water that's clogging up your pipes. Obviously it doesn't get rid of all of it. Thu, Jan 31, 2013 : 5:48 p.m.
You should see the bottom of my home water-distiller. It's covered in lime (among other unsavory elements)! Thu, Jan 31, 2013 : 2:35 p.m.
A little A2 history.....we should all be overjoyed we have an H2O plant to upgrade. in the 1970s , there was a big push by Detroit for most of SE Michigan to hook up to their water system (they needed more revenue... so what's new?). We did not want to be controlled by a government 50 miles away that our citizens could not vote out of office. Also, &quot;They who control the water supply ,controls the land use and the water bill&quot;. Ypsilanti chose Detroit so it was close....we said &quot;No way&quot; and immediately negotiated agreements with the surrounding townships to supply their water when they wanted it or needed it....the new plant upgrades need to be pushed through and supported with a great sigh of relief. Fri, Feb 1, 2013 : 2:33 a.m.
A little more local history. Louis Belcher was the Mayor of Ann Arbor from 1978-1983. Among his many other contributions he esrablished what is now the City's Energy Commission. Thanks Mr. Mayor ! Thu, Jan 31, 2013 : 3:19 p.m.
Another good reason to have a water source and our own treatment plant..read &quot;The Ripple Affect. &quot; You'll view water in a whole new light. Thu, Jan 31, 2013 : 2:25 p.m. Survival time needs for Ann Arbor area. Physical security - Immediate. Breathable Air - Minute. Climate Change Shelter - Hour. *Potable Water - Week. Edible Food - Month. Recreation - Year Tax Deferment - Two Years Education - Five Years Reproduction - 32.5 Years Social Security - 65 Years DDA - Unneeded. Thu, Jan 31, 2013 : 1:06 p.m.
Thu, Jan 31, 2013 : 1:01 p.m. I can say safely say that I had no idea we drink water from the Huron River. Fri, Feb 1, 2013 : 3:49 a.m.
Fri, Feb 1, 2013 : 3:03 a.m.
O I remember when Allen and Rumsey where first staking out Ann Arbor..........does that help? As for electricity? I remember Franklin toying with the idea. Kind of shocking if you ask. me. As for gas? I am not even going there. Thu, Jan 31, 2013 : 8:20 p.m.
And you've lived in Ann Arbor how long? Welcome to the world. I bet you don't know where your electricity or gas come from either. The river gets a bad rap in Ann Arbor, yet is far cleaner than it was in decades past. We are really not far from having it clean enough to put a swimming beach at one of the ponds. Thu, Jan 31, 2013 : 6:45 p.m.
Our fore fathers Allen and Rumsey did it and so shall we. They use to do tours thru there for Ann Arbor. They don't any more. Sad. Thu, Jan 31, 2013 : 2:44 p.m. In case that freaks you out, the city reports its drinking water meets or exceeds all standards and regulations and has won numerous awards for its taste. Thu, Jan 31, 2013 : 1:20 p.m.
Thu, Jan 31, 2013 : 12:54 p.m.
Tens of millions on capital improvements = hundreds of thousands siphoned for art. Thu, Jan 31, 2013 : 2:49 p.m.
What kind of art would you like to see? As the Percent For Art ordinance is currently worded, I believe it would have to relate somehow to the source fund, so theoretically it would have to be water themed. What about something along the Huron River?